The 1200s started out looking good for the Islamic world. The Crusaders had been defeated and Jerusalem liberated in 1187, the Ismaili Fatimids had finally been removed from harassing the Muslim world in the mid-1100s, and a powerful Khwarazmian Empire had emerged in Persia. However, all that would soon turn around when the ruthless Mongols would make their way into Southwest Asia. The destruction and devastation they left in their path has scarcely been seen anywhere else in history. The Mongols were a tribe of nomads from Central/North Asia. They lived on the steppe of that region, relying on a nomadic lifestyle of constant movement as a way of life. They were forever dependent on and attached to their horses, which was their main mode of transportation. Religiously, they were polytheistic animists. They never established a large, organized empire, and instead stayed as a loose coalition of tribes north of China. Throughout history, they were usually at war with their neighbors. China to the south in fact built the Great Wall of China during the reign of Emperor Shi Huang (247-221 BC) as a means to keep the Mongols and others away from their villages. The Mongols also feuded with other tribal groups in Central Asia such as Turkic tribes and the Tatars. Mongolian (and world) history changed forever during the rule of Genghis Khan. He was a tribal chief for the Mongols from 1206-1227. During his reign, he managed to unite the many Mongol tribes along with numerous Turkic tribes as well. With a large, unified group, he set about conquering any and all land the Mongol horsemen could reach. He conquered most of Northern China in the 1210s. In doing so, he destroyed the Xia and Jin dynasties, as well as conquered Beijing. He also managed to conquer most of the Turkic tribes of Central Asia, leading all the way into Persia. This led him to send armies into Eastern Europe as well, attacking Russian lands and even the borders of Central Europe’s German states. 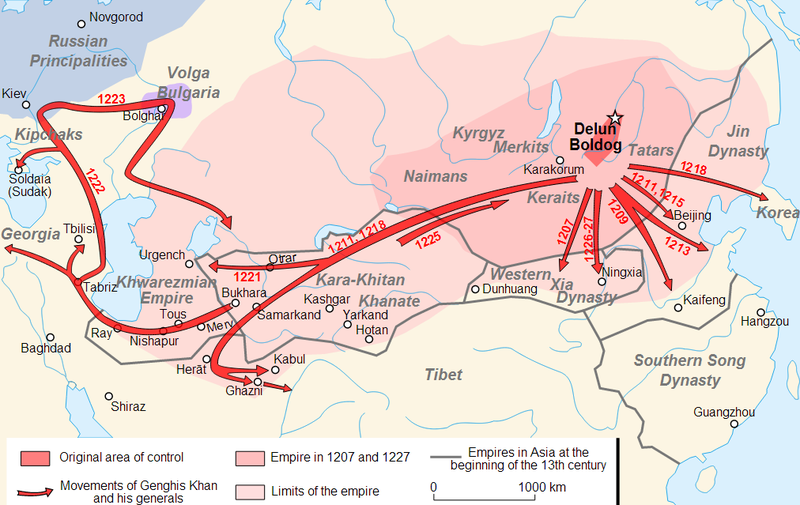 By the 1220s, Genghis Khan’s armies had ravaged much of Asia and even Europe. More important than what Genghis Khan conquered was how he conquered. He deliberately used terror as a weapon of war. If a city he was besieging gave up without a fight, its people would usually be spared but would have to go under Mongol control. If the city fought against the Mongols, everyone, including civilians, would be massacred. This reign of terror is a large part of why he was such a successful conqueror. People were more willing to give up than to suffer massacres at his hand. For example, when he besieged the city of Herat, in present-day Afghanistan, he killed over 1,600,000 people. Besides some raids and massacres on the borderlands of Islam, Genghis Khan did not invade far into the Muslim world. Under his successor, Ogedei, the Muslim world continued to be spared Mongol wrath. In 1248, however, Genghis Khan’s grandson Möngke became great khan of the Mongols and resolved to extend his sway to the Middle East and beyond that, if possible, to Syria and Egypt. Ten years later Mesopotamia was overrun by a Mongol horde under his brother Hulagu. Hulagu was born to Tolui, one of Genghis Khan's sons, and Sorghaghtani Beki. Hulagu's mother successfully navigated Mongol politics, arranging for all of her sons to become Mongol leaders. She was a Christian of the Church of the East (often referred to as "Nestorianism") and Hulagu was friendly to Christianity. Hulagu's favorite wife, Doquz Khatun, was also a Christian, as was his closest friend and general, Kitbuqa. It is recorded however that he converted to Buddhist as he neared death, against the will of his wife Dokuz Khatun. Due to his close affinity to christianity, he was supported by crusaders in his military endeavors. The campaign’s goal appears to be a complete destruction of Islam. Hulagu himself even had a very deep hatred for everything attached to Islam. Much of this came from his Buddhist and Christian advisors who influenced his policies. Baghdad had been established in 762 by the Abbasid Caliph al-Mansur. Throughout its history, it had been the capital of the Muslims, as well as the world in general. The libraries of Baghdad were unrivaled. The House of Wisdom, established soon after the city was built, was a magnet for the most intelligent scientists, thinkers, mathematicians, and linguists of the world. The caliphs were patrons of literature, science, and the arts. Although by the mid-1200s much of the glamour and importance of Baghdad was gone. The caliphs were figureheads more interested in worldly pleasures than serving God through serving the people. The Abbasid army was effectively non-existent, and only served as bodyguards of the caliph. And the scientific achievements of the Muslim world were now centered in places such as Cairo, Muslim Spain, and India. Al-'Alqami, a shiite, was a minister in the court of the Caliph al-Musta'sim. Like Chalabi, al-'Alqami had desires of leadership of the land and, like Chalabi, he was not above soliciting the assistance of foreign powers to help – even if that assistance would come at great cost to his people or his nation. America was not a superpower in al-Alqami's time so he turned his attentions to the Mongols. Al-'Alqami wrote a number of letters to the leader of the Mongols, Hulagu Khan, inviting him to invade the land, promising' his support and offering "intelligence" on the Caliph's armies, their strengths and weaknesses, and the overall lay of the land. It would, he assured the Mongols, be a cakewalk and within a short space of time the Mongol Empire could be extended into the previously impervious core of the Muslim Caliphate. At the same time, Al-'Alqami used his position to influence the Caliph to reduce the size of the army thus ensuring that the Mongol invasion would be guaranteed little resistance. He also lied to the Caliph about the severity of the invasion, assuring Al-Musta'sim that, if the capital of the caliphate was endangered by a Mongol army, the Islamic world would rush to its aid. The Caliph had also been deluded by promises from his greedy wicked vizier, Al-Alqami, that the Mongols could be driven off literally by the women of the city throwing stones at them. On the other hand, Hulagu accepted al-'Alqami's generous invitation to attack, pillage, and massacre. The Muslim world at this time was in no position to resist the Mongol attacks. The Abbasid Caliphate was nothing but a shell of its former self, having no power outside of Baghdad. 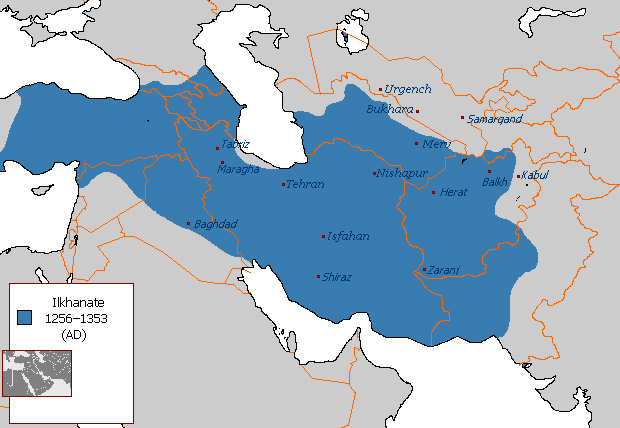 Most of Persia was disunited as the Khwarazmian Empire had mostly deteriorated by then. The Ayyubid state established by Salah al-Din was only in control of small parts of Iraq and Syria. In Egypt, a recent revolution had overthrown Salah al-Din’s descendants and brought to power the new Mamluk Sultanate. With his giant army of hundreds of thousands, Hulagu did not encounter much resistance. The force to eliminate Islam was supplemented by a de facto alliance between Mongols and Christian forces, including the King of Armenia and his army, a Frankish contingent from the Principality of Antioch, and a Georgian force, seeking revenge on the Muslim Abbasids for the sacking of their capital, Tiflis, decades earlier by the Khwarazm-Shahs. About 1,000 Chinese artillery experts also accompanied the army. The Crusaders and the Armenians also attacked in northern Syria diverting some of the Turkish contingents that might have been available for the defense of Baghdad. As per Mongol custom, he first issued a written threat to the Caliph: "When I lead my army against Baghdad in anger, whether you hide in heaven or in earth, I will bring you down from the spinning spheres; I will toss you in the air like a lion. I will leave no one alive in your realm; I will burn your city, your land, your self. If you wish to spare yourself and your venerable family, give heed to my advice with the ear of intelligence. If you do not, you will see what God has willed." The Caliph refused the Mongol offer to surrender and decided to defend his city against their onslaught. It was at this historic and landmark city that the Mongols arrived in 1258. Scholars debate the exact size of Hulagu’s force, but it was enormous by the standards of the time. The ordu (“army” in Turkic, from which comes the English “horde”) comprised approximately 300,000 warriors, all master horsemen and archers. Their training, discipline, reconnaissance, mobility and communications far surpassed those of any contemporary force. Organized in units based on factors of 10, they could cover 100 miles in a day. Including women, children and other noncombatants, the entire host numbered, by conservative estimates, about two million. This massive army stood before the city that was just a shadow of the great capital of the Muslim world of the 800s. The siege began in mid-January and only lasted two weeks. On January 29, the Mongol army began its siege of Baghdad, constructing a palisade and a ditch around the city. Employing siege engines and catapults, the Mongols attempted to breach the city's walls, and, by February 5, had seized a significant portion of the defenses. Five days later, on February 10, the city surrendered. While the Muslim armies put up a good fight, the reduced size of the army (due to the machinations of al-'Alqami) meant that they were no match militarily for the Mongols. The attacking Mongols broke dikes and flooded the ground behind the caliph's army, trapping them. Much of the army was slaughtered or drowned. On February 10th, 1258, the Mongols entered the city of the caliphs. A full week of pillage and destruction commenced. No description can do justice to the horrors that followed. 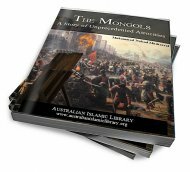 The Mongols showed no discretion, destroying mosques, hospitals, libraries, and palaces. The Grand Library of Baghdad, containing countless precious historical documents and books on subjects ranging from medicine to astronomy, was destroyed. Survivors said that the waters of the Tigris ran black with ink from the enormous quantities of books flung into the river and red from the blood of the scientists and philosophers killed. The world will never truly know the extent of what knowledge was lost forever when those books were thrown into the river or burned. The dams on the Tigris and the Euphrates that the Abbasids had built up over a period of five centuries were demolished. The destruction of dams throughout Central Asia depressed agriculture and slowed population and economic recovery for many centuries. More important than the books, however, was the loss of life. Citizens attempted to flee, but were intercepted by Mongol soldiers who killed in abundance, sparing neither women nor children. Martin Sicker writes that close to 90,000 people may have died (Sicker 2000, p. 111). Other estimates go much higher. Wassaf claims the loss of life was several hundred thousand. Ian Frazier of The New Yorker says estimates of the death toll have ranged from 200,000 to a million. The muslim women who used to hide behind the veils of the great Harem were dragged through the streets and alleys, each of them becoming a plaything. Baghdad was left completely depopulated and uninhabitable. Ibn Kathir, one of the scholars of Islamic History noted in his magnum opus, Bidaaya wa Nihaya, that the Mongols killed so many people that blood would be running down the street like rainwater. After massacring entire towns and villages, they assembled huge pyramids of human skulls as a reminder and warning that the Mongols were passing through. It would take centuries for Baghdad to regain any sort of prominence as an important city. The siege is considered to mark the end of the Islamic Golden Age, during which the caliphates had extended their rule from the Iberian Peninsula to Sindh, and which was also marked by many cultural achievements. After taking Baghdad the decision had to be made as to what would be done with the Caliph. It is narrated that upon finding the caliph's great stores of treasure which could have been spent on the defense of his realm, Hulagu Khan locked him in his treasure room without food or water, telling him "eat of thy treasure as much as thou wilt, since thou art so fond of it." The Mongols had a superstition which prevented them from spilling the blood of kings onto the earth. Al-'Alqami had no such qualms and suggested that rather than kill his leader with a sword, they should roll him and his family in carpet and then kick them to death. Al- Alqami volunteered for the task and proceeded to kick his former employer till he died. The Mongol Coalition of the Willing became strained at this brazen rejection of Mongol International Law. The death of the Caliph ushered in a new era of Mongol-imposed brutality on the majority Sunni population (back then, the Shi'a were still a minority in Iraq). However for all their cruelty, viciousness and relatively barbaric rules of engagement, the Mongols were pragmatic. They realized that men like al-'Alqami that would sell their people and nation to a foreign invader couldn't be trusted. If a man holds no loyalty to his own people, then how can he be trusted to hold loyalty to an invader and occupier? Al-'Alqami had hoped to be the Mongol's vicegerent in the region, but instead he became their slave. Any effort to dilute or subvert the practice of Islam in the lands under occupation was seen by the Mongols as a pre-requisite to maintaining the occupation. They therefore imposed a law over their subjects, which – like present day "reformists of Islam" – was essentially non-Islamic but couched into vague references and pseudo-Islamic terminology. The Mongols called their law al-Yasiq. In their controlled lands, they also started to weaken affiliation of muslims to Arabic language. Under Hulagu's dynasty, Iranian historians began writing in Persian rather than Arabic. After Baghdad, the Mongols continued on westward. Hulagu established himself in Hamadan from where he organized more expeditions. All of Iraq was subjugated. In 1260 Mongol forces combined with those of their Christian vassals in the region, including the army of Cilician Armenia under Hetoum I and the Franks of Bohemond VI of Antioch. This force conquered Muslim Syria, a domain of the Ayyubid dynasty. They took the city of Aleppo and, under the Christian general Kitbuqa, took Damascus on March 1, 1260. A Christian Mass was celebrated in the Grand Mosque of the Umayyads, and numerous mosques were profaned. The invasion effectively destroyed the Ayyubid Dynasty, theretofore powerful ruler of large parts of the Levant, Egypt, and Arabia. The last Ayyubid king An-Nasir Yusuf was killed by Hulagu in 1260. With the Islamic power center of Baghdad gone and Damascus weakened, the center of Islamic power transferred to the Egyptian Mamluks in Cairo. It is against this backdrop of occupation and foreign laws imposed on the population that one of the most influential and important figures in Islamic history would emerge. His name was Ibn Taymeeyah, The Sheikh-ul-Islam (The Scholar of Islam) as he has been affectionately known throughout the ages. When faced with the imposition of the Mongol's foreign systems of government and laws on the Muslim population, he rallied against the Mongols and those who had supported them, declaring that whoever implemented such laws was a disbeliever in Islam: "Whoever does this is an infidel who must be fought until he returns to the rule of Allah and His messenger. So no one other than He should rule neither minorly or majorly." This was the first time that a foreign system of belief had been forced on the heartland of the Muslim world, and Ibn Taymiyah's lengthy fatwa provides the theological underpinning for Muslim resistance to man-made laws in every country in the Muslim world. He concluded by stating that defending the Muslim lands and expelling the occupying army is the second most important obligation of a Muslim after believing in Allah. Hulagu intended to continue south through Palestine towards Cairo to engage the Mamluks. Meanwhile, in 1252, Berke Khan converted to Islam, and in 1257 he assumed power in the Golden Horde after the death of Ulaghchi. Like his brother Batu, he was loyal to the Great Khan Mongke during this time. Although aware of Berke's conversion to Islam, Hulagu, after conquering Persia, didn't stop himself from destroying Baghdad in 1258 and committing such atrocities. Regardless of Berke's affiliation with Islam, Hulagu added Iraq to the Mongol Empire in the cruelest of manners and advanced towards Syria and Mamluk Sultanate to begin a war of attrition against the Mamluk Sultanate. Berke became enraged with Hulagu's rampage through Muslim lands, and as a preparatory step, directed his nephew Nogai Khan to collect finances for a war with Hulagu. Berke then struck an alliance with the Mamluk Sultan Qutuz and later Sultan Baibars of Egypt. The Mongols, for their part, attempted to form a Franco-Mongol alliance with (or at least, demand the submission of) the remnant of the Crusader Kingdom of Jerusalem, now centered on Acre, but Pope Alexander IV had forbidden this. Tensions between Franks and Mongols had also increased when Julian of Sidon caused an incident resulting in the death of one of Kitbuqa's grandsons. Angered, Kitbuqa had sacked Sidon. The Barons of Acre, contacted by the Mongols, had also been approached by the Mamluks, seeking military assistance against the Mongols. Although the Mamluks were traditional enemies of the Franks, the Barons of Acre recognized the Mongols as the more immediate menace. Instead of taking sides, the Crusaders opted for a position of cautious neutrality between the two forces. In an unusual move, however, they agreed that the Egyptian Mamluks could march north through the Crusader territories unmolested and even camp to resupply near Acre. The turning point for the Mongol occupation came in September, 1260 when they had moved into Palestine and encountered The Mamluks - a Muslim nation based in Egypt. Hulagu sent a threatening letter to Mamluk Sultan Qutuz in Cairo. He demanded that Qutuz open Cairo or it would be destroyed like Baghdad. That same year, Mongke died in a military campaign in China. This situation resulted in recalling Hulagu back to Mangolia, as an heir and potential Great Khan, to Mongolia in order to elect a new Khan. Rashid al Din quotes Berke Khan as sending the following message to Mongke Khan, protesting the attack on Baghdad, (not knowing Mongke had already died in China). "He (Hulagu) has sacked all the cities of the Muslims, and has brought about the death of the Caliph. With the help of God I will call him to account for so much innocent blood." History proved his words correct in not more than a few years time. While leaving, Hulagu left behind only two tumens (20,000 men) under the leadership of his favorite general Naiman Kitbuqa Noyan, a Nestorian Christian. Upon receiving news of Hulagu's departure, Qutuz quickly assembled a large army at Cairo and invaded Palestine. Qutuz allied with a fellow Mamluk, Baibars, who wanted to defend Islam after the Mongols capture of Damascus, sacking of Baghdad, and subjugation of Bilad al-Sham. "Despicable man, you have shed so much blood wrongfully, ended the lives of champions and dignitaries with false assurances, and overthrown ancient dynasties with broken promises. Now you have finally fallen into a snare yourself." "From the head of the Mongol army, anxious to devastate the perfidious nation of the Saracens, with the good-will support of the Christian faith (...) so that you, who are the rulers of the coasts on the other side of the sea, endeavor to deny a refuge for the Infidels, your enemies and ours, by having your subjects diligently patrol the seas." —Letter from Hulagu to Saint Louis. When he massed his armies to attack the Mamluks and avenge the defeat at Ain Jalut, he was instead drawn into civil war Berke - Ghengis Khan's grandson and Muslim convert from the rank of Mongols who promised in his letter to Mongke about the revenge for innocent blood shed in Baghdad. Berke Khan allied himself with the Mamluks. He initiated a series of raids on Hulagu's territories, led by Nogai Khan. Hulagu suffered a severe defeat in an attempted invasion north of the Caucasus in 1263. This was the first open war between Mongols and signaled the end of the unified empire.Berke also dispatched Negudar to eastern Afghanistan and Ghazni, recovering lands under Il Khanate control. Berke was responsible for the first official establishment of Islam in a khanate of the Mongol Empire. Only the Ganges plains of India escaped the Mongol conquests thanks to the resistance of the Mamluke sultans of India and the statesmanship of Altumish and his daughter Razia Sultana. Despite ultimately being unsuccessful in their attempt to destroy Islam, the Mongols left a deep political, economic, and military scar in the heart of the Muslim world. Entire regions were depopulated. Irrigation canals, fields of crops, and economic infrastructure were destroyed beyond repair. The political institutions, such as the caliphate, that held the Muslim world together for centuries were simply abolished. The empire established by Hulagu stretched over most of Muslim Southwest Asia. The Mongol Il-Khanate established by Hulagu’s descendants would rule over Persia, Iraq, and Anatolia for over 100 years. Over decades and centuries, the Mongols in Southwest Asia slowly converted to Islam and became absorbed in a Persian/Turkish culture. But there is no denying the immense negative effect the Mongols had on the Muslim world in the 1200s. The death and destruction of the 1200s has not yet been seen again in the Muslim world. The Muslim world was largely unable to repel the Mongol invasion due to disunity and weak political and military institutions. Throughout Islamic history, disunity has always led to invasion and defeat, while unity has led to great Islamic empires that benefited the entire world.